The shape of the prop is unmistakably authentic! Amidst the tiny number of early surviving Dalek props, there is one which tells a remarkable story. Not only does it feature the only remaining skirt from the original batch of four Daleks made by Shawcraft in 1963, but it also appeared in all 10 of the first Dalek stories and starred alongside the first four Doctors. Whilst the whole prop is packed with history, the really incredible part is the unique, first generation Shawcraft skirt. Other surviving 60s skirts date from later batches and no others have the particular hemisphere arrangement on the rear panels which were limited to just the original four Daleks made in 1963. 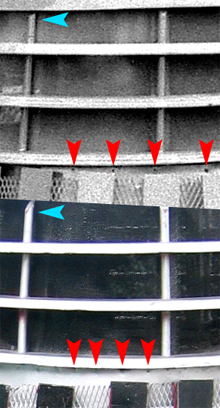 The rear two columns of hemispheres on the first four Shawcraft Daleks have a more pyramid-shape arrangement. When compared to the second generation of props made in 1964, the difference is clear. The later ones have more parallel columns, with the lower two hemispheres closer together, which was the pattern carried into the third generation of skirts used in the movies and on Dalek Seven. 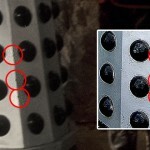 This small difference is a very pleasing sight to Dalek fans. The most surprising aspect of the prop is that it had numerous features when it left the Shawcraft workshop, which allow the earliest photos from the first Dalek serial to be examined for identification. Below is a comparison image which shows that even after 50 years of repainting the same nails can be still be seen which hold the lower wooden return in place within the fibreglass shell – as well as another, more mysterious nail higher up! For the Daleks’ second adventure, the skirt was used again, fitted with the new, larger fenders. During the height of Dalekmania, these props were drafted in for all manner of publicity stunts. The subsequent damage they suffered allows them to be identified easily but it is surprising to see the chips and dents have not been concealed by a dozen or more later paint layers. This black and white photo shows that, incredibly, the paint layers can be interpreted like archaeological strata. The second layer after the first silver coat is black, showing the period when this was the Black Dalek in The Dalek Invasion of Earth! 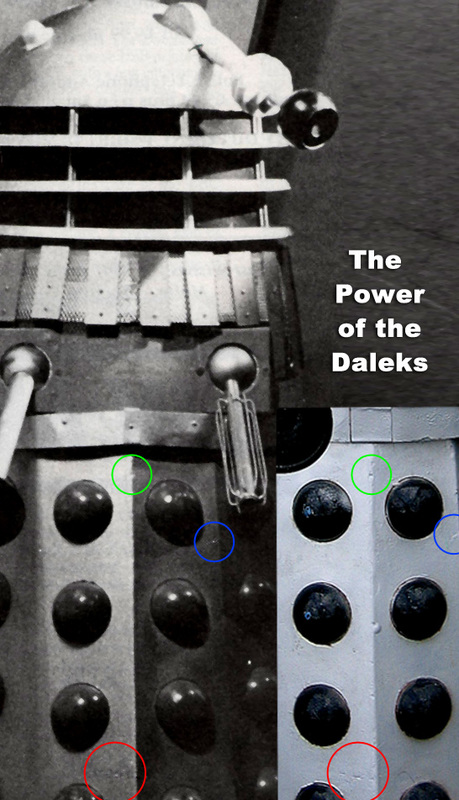 For The Dalek Invasion of Earth, the prop was painted in black stripes at first to portray the Saucer Commander in episode two, and ultimately entirely black for the Supreme Dalek in episode three onwards. Where the paint has been chipped down to the fibreglass it is possible to see each of the dozen or so repaints this prop has had over the years. 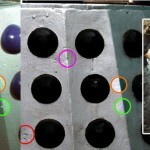 Amazingly, the second layer can be seen to be black, showing the repaint from 1964. With Dalek Three and Dalek Four having been given to Barnardo’s, this skirt became one of only two originals to continue on in the show. All evidence points to the eventual destruction of the props that were donated to the Children’s Home, leaving just two remaining at this point. The image below shows the skirt in its next outing for The Chase in 1965. The photo was taken at Riverside Studios during filming of the battle with the Mechonoids and it reveals a very interesting change which took place. The modern photo on the right shows the prop now has a new wooden rim fibreglassed into the top of the skirt. This addition does not hide the distinctive chunks of damage which are visible along the edge in 1965, especially on the top left of the rear skirt panel. It is interesting to note that the addition of this wooden section will have fractionally increased the overall height of the Dalek as the shoulders then sat higher on the skirt. The old photo above also shows the foam which Shawcraft fitted around the inside of the skirt to make life more comfortable for the actors’ knees. 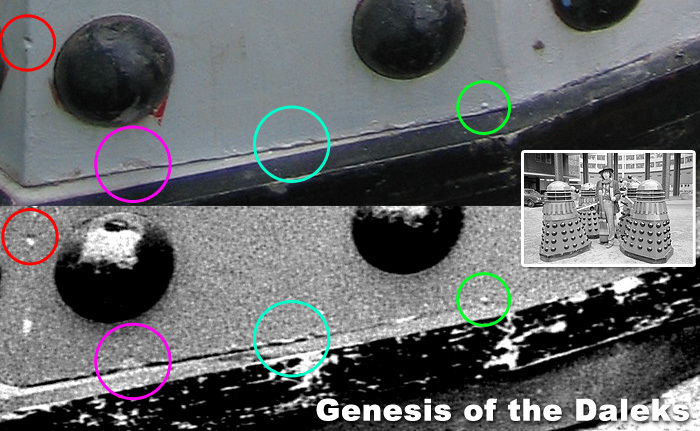 Remnants of these strips of foam are still present inside the Dalek (see sidebar). The skirt continued on in the final Hartnell Dalek story The Daleks Master Plan before meeting the Second Doctor in Power of the Daleks. Two of the skirts in Troughton’s debut story were second and third generation types (the latter having what many people consider “movie Dalek misalignment” on the hemispheres). creatures in the Capsule and photos of this prop were widely used to publicise the return of the monsters and the change of lead actor. 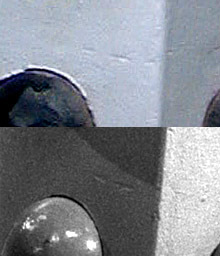 This comparison photo on the right shows several subtle but distinctive areas of damage in the front of the skirt which can be seen in the studio set for the Dalek Capsule and also in the present day. One small but significant detail is a scratch at the bottom of one of the front panels where a sharp object has etched into the surface (see left). The extensive behind-the-scenes photos from Power provide a number of excellent shots from which to draw comparisons. 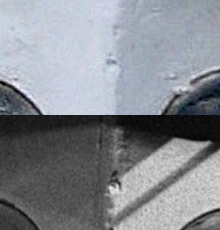 The image below of the right-hand sides then and now again reveal distinctive surface damage to the edges. These protruding corner points were always the most prone to damage as the props were manoeuvred around. The next outing for this prop was in The Evil of the Daleks where it formed part of the group of props which fought the final battle on Skaro. This ambitious sequence was shot on film and saw Dalek Two feature in dual roles as both a humanised Dalek and also one loyal to the Emperor. This prop was present as the final catastrophic scenes were filmed but, as is often the case in television, these battles were shot first and the Dalek had to be cleaned up quickly (and a new Emperor built) ready for videotaping the rest of the story. When the Daleks were off screen after their supposed “final end” they continued to do publicity work, and this skirt is pictured at BBC Cardiff in 1967 (see sidebar). It would also have been one of the three props that featured in the episode of Out of the Unknown, sadly missing from the archives. When the Daleks returned to face Jon Pertwee in 1973 they did so in colour and this skirt was once again chosen to depict the leader. This prop became the first-ever full-colour TV Dalek as it was painted gold for Day of the Daleks. 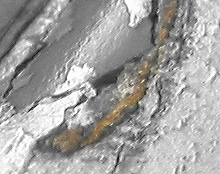 Once again, the paint strata evidence confirms this, showing a layer of gold about half way down (see right). 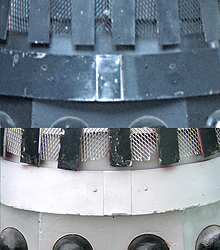 The photograph above reveals that prior to their reappearance in the Jon Pertwee era, the Dalek props had internal refurbishment as well as an external one. 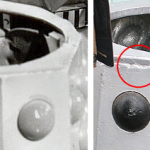 As can be seen in both the 1973 photos (although not clearly) and in the modern silver/grey picture, as well as a feature above one of the front hemispheres, four new holes have been drilled through the shell through which bolts have been threaded. Internal examination of the prop reveals that these bolts are to retain handles for the operators, to help them shift the weight of the Dalek around. Such fixtures would have become increasingly necessary as each new colour scheme added the weight of a pot of paint to the prop, making it harder and harder to propel. When Shawcraft props were first built they were light as a feather (as revealed in The Chase when they are “walked” across the sands and lifted up by Frankenstein’s Monster) but the more refurbishment they got, the more they weighed, increasing the strain on the actors. It is clear from the similar angle above in Power of the Daleks that no such handles were present on this prop in the sixties. Because of the purge of props at the end of the 1960s, Day of the Daleks would be significant for Dalek Two‘s skirt as it became the sole survivor of that first batch of Daleks from 1963. Unlike the earlier props which were constructed from fibreglass, this set of Goons had a wooden skirt and an aluminium shoulder section. Their original purpose of these Daleks was just to act as scene fillers and they lacked a seat and other aspects of the internal workings which the hero props had. They were designed by Cliff Culley and his team at Westbury Design and Optical Limited and their distinctive characteristics has made them easy to spot down the years. This Dalek today which survives does not have a Shawcraft top section but instead it has an aluminium frame and all the other distinctive characteristics which prove that it too was constructed by Culley’s team who worked on the 1973 serial Planet of the Daleks … but more on that later. 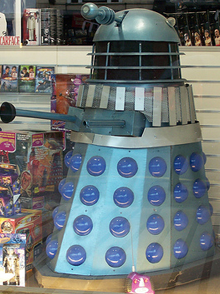 The following production was Death to the Daleks for which all the remaining Daleks and also one “Goon” were repainted into a new high-contrast colour scheme of a silver base colour with black details. Dalek Two was one of the props taken out on location to film the quarry scenes which were intended to represent the planet Exxilon. 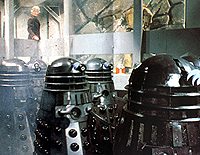 One scene required the natives to surround a Dalek and attack it. 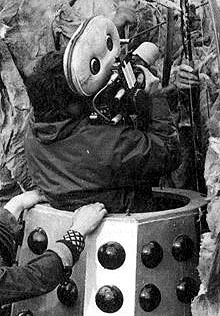 To create the smooth tracking motion needed in the shot, a cameraman sat inside the skirt of the Dalek and he was pushed along by another member of the crew. 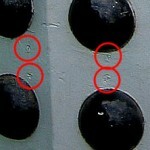 Photos taken at the time show the same telltale damage along the top edge of the skirt which was highlighted above in The Chase. But, by this time, the additional wooden platform had been added to the top of the skirt. The locating bolts in the new panel are in a different position to before. Publicity photos from this serial show that once again the damage on the leading edge of the skirt is one of the most useful areas to assist with identification. 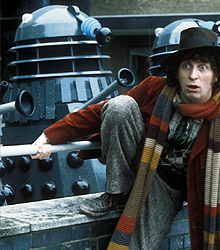 When the Tom Baker was cast as the Fourth Doctor, the Daleks were on hand to give him a baptism of fire and the same props were used again with some more refurbishment. Publicity photos of the new Doctor were taken outside television centre and these high resolution images show a particularly nice detail about the skirt of this surviving Dalek. 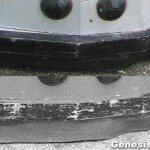 When the fenders were refurbished for Day of the Daleks a year earlier, they were given a new edging with a strip of black plastic around the top. This was later repaired again with a rigid strip of rubber. 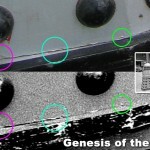 One of the most surprising things about the Dalek (and another unique feature) is that it retains the original fender which dates from the 1970s. Remarkably, the undulations of the rubber are unchanged after 40 years as can be seen the famous publicity photo below matching a recent picture. 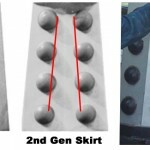 Further close analysis of this photo shows yet more examples of damage that can be seen on the prop in the present day which already existed when the skirt was being used on TV. Study the lower edge of the side panel and all the same chips and bumps can be seen in both pictures, as well as a prominent nail which holds in the wood above the fender. 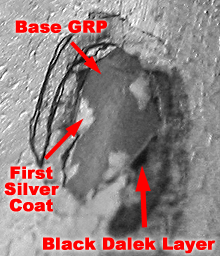 The pattern of damage is so distinctive that it acted as a “fingerprint” which was key to the identification of this prop and proof beyond any doubt whatsoever that it was the genuine article. Expert analysis from seasoned Dalek fabricators has revealed that, as was the case with all the TV props, old parts had been recycled where possible. The interior of the neck shows signs that it dates from a late generation of Shawcraft props, being of the right construction and age of the late 60s Daleks. This would date it to around the build of Dalek Eight for The Evil of the Daleks, during the final months of Shawcraft’s involvement with the show. 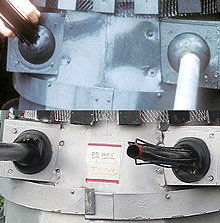 The skirt of Dalek Eight still survives to the present day too so it is not inconceivable that other parts of the prop were salvaged or retained too. Or it may have been just another spare part left from one of many refurbishments. 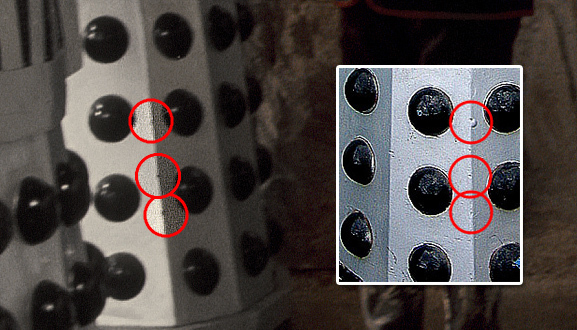 The majority of the top half of the Dalek is quite distinctive. In 1973, the story Planet of the Daleks boasted a set of brand new Dalek props which, for the first time, where not built by Shawcraft but, instead, were contracted out to a company called Westbury Design and Optical Limited. This new company was given an original Dalek to copy but used their own methods for fabrication of the new line of Daleks. 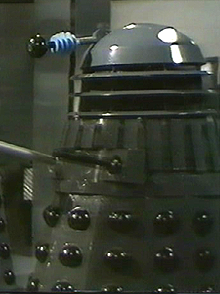 The methods of 1973 are exactly those seen in the surviving Dalek, indicating that the top half is very much of “Goon” construction. Beginning with the head, the shape is exactly right for a 1970s prop and the resin the right colour. The eye of a Goon prop has a peculiar set of three large discs and one smaller one at the front, all made from hardboard. 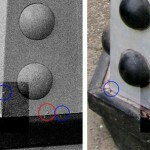 The shape, materials and construction of the surviving Dalek match exactly. The heavy wooden eyeball is covered in thick paint but the lens assembly screen-matches Planet of the Daleks. The gun is a perfect example from the era – now slightly rusty from age and has “prop-handler’s squish”. The heavy thickest stage of the arm and plunger are both the same as those from the 70s. 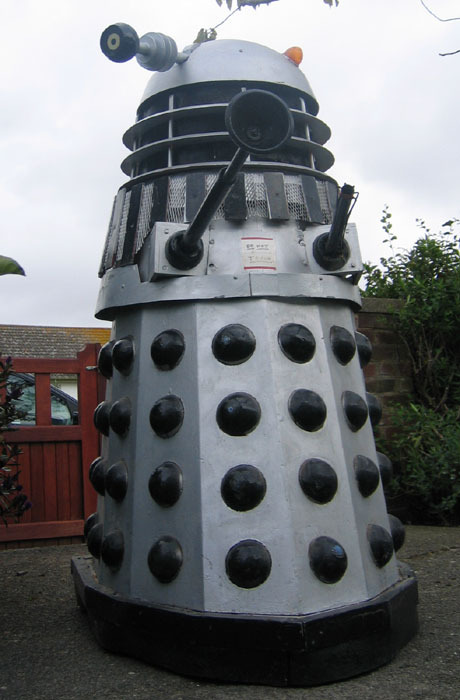 The pivot point is mounted with randomly-positioned screws as was the case with other Goon Daleks, and it is set shallower in the head than Shawcraft props. Having the eye mounted lower meant that the stalk rested on the slot in the dome, which prevented these static props from looking down when there was no operator inside. 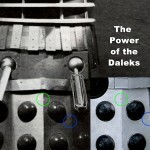 Whereas the original Daleks had a neck section whose vertical rods had a “clover leaf” cross-section, “Goon” props were a single dowel with a circular cross-section. They were chamfered at the top to prevent them catching as the dome spun. Whereas Shawcraft’s collars’ halves were held together with a narrow strip, these Goon props had a broad wrap. Goon shoulder sections were made with an aluminium shell and around the top edge (usually concealed by the shadow of the lowest neck ring) a circuit of nails was hammered in to fix the wooden return. This ring of nails makes the top of Goon shoulders quite distinctive (see sidebar) but good photos are hard to come by. 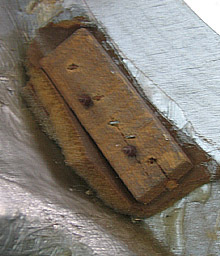 The lower collars of Goons had distinctive, wide “wraps” at the front and rear to hold together the two halves of metal. Shawcraft held theirs together with just a very narrow strip at the rear which makes this version another telltale sign of Westbury’s handiwork. The unfortunately imperfect nature of Goon construction is all too present in these shoulders: As was typical with the 1970s Daleks, the mounting for the limbs is too close to the bottom of the boxes and the faces aren’t deep enough. The gunboxes are made from wood and roughly assembled with their edges visible. Their insertion into the front of the aluminium is shoddy (see sidebar) and is noticeably poor in the the famous Tom Baker publicity photos – even though the props were quite young at this point. Sadly, due to the paucity of images of these “scene filler” Daleks, there is not enough material to screen-match the components to a particular prop. Several of the Goons are known from only one or two blurred images, such was their infrequent use. Soon after their debut story, two Goons were used as FX props which meant that their life-spans were short-lived but the bits that could be salvaged were useful spares. 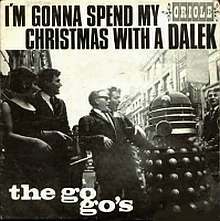 The fact that one Goon was set alight in Death to the Daleks might be a clue in the tale. With the shell being made from metal, it would have survived the fire, but the wooden gunboxes would have perished. One obvious feature that this prop has now is that there are no holes for the pivots which means that the current gunboxes have never been articulated. Dalek for hire: Goon shoulders with a newly-built skirt, photograph: Mark Kelly. This is indicative of the way the BBC were putting together Daleks for publicity purposes. During the mid-1970s the BBC started to run an additional money-earner which capitalised on the popularity of the Daleks. For a fee, anyone could hire out Daleks for their own uses at public fetes or birthday parties. 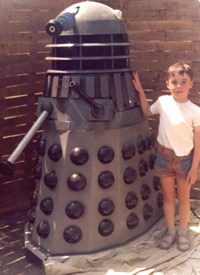 For many years it was possible to borrow BBC Daleks, as numerous private photos testify. During this period, a number of additional components and cannibalised parts were assembled to ease the burden of their constant use, and reduce damage. The Daleks may have been off-screen but the BBC still continued to create new props for their own purposes. 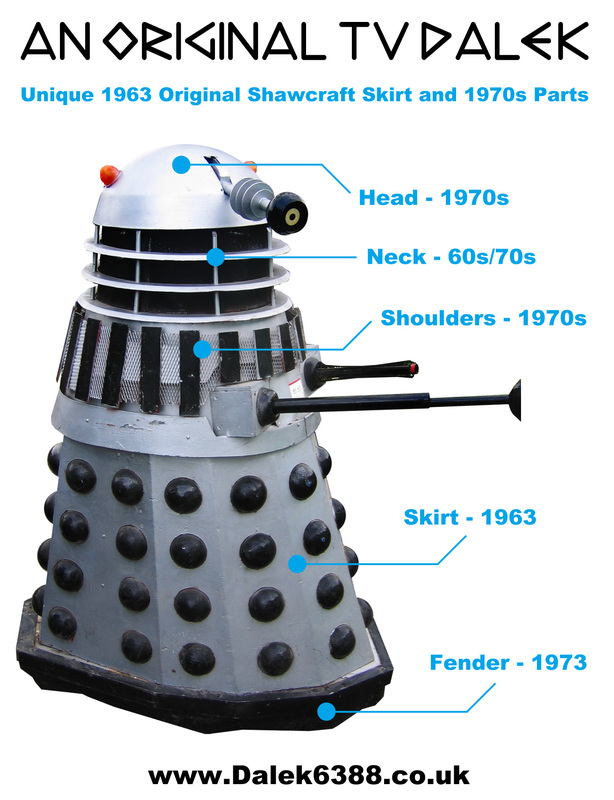 Several of these sections have survived to the present day with their origins blurring the lines as to the definition of an “original” Dalek, and causing much debate as to their authenticity because they can’t always be spotted in an episode. 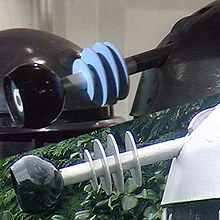 Following its final appearance in Genesis of the Daleks, the skirt of Dalek Two was removed from the pool of TV props and became paired up with its current Goon-type shoulder section. The gunboxes which would have been constructed around this time were done quickly and cheaply without articulation. This meant that they would hold out better against the wear and tear of public use. 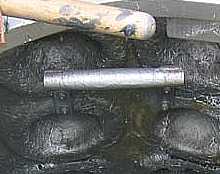 Rubber balls were cut in half and stuck on in place of the joints. 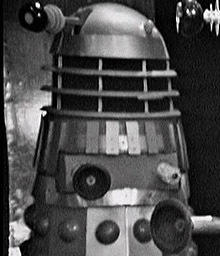 The less complex arrangement still approximated the look of a hero Dalek but ensured there was less to break and also stopped the limbs from ever drooping when on display – just like the Goon eye stalk had been originally designed to do. 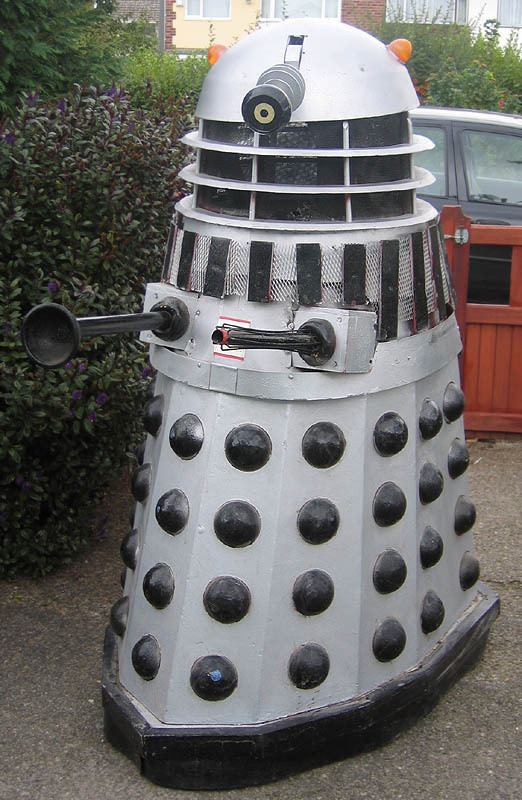 Additional skirts were built to join this group of “publicity Daleks”, two of which had a particular feature whereby screws were mounted externally down each panel of the skirt. 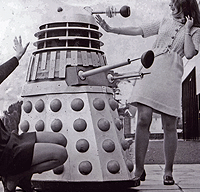 One of these skirts, which became known as “the oddball” due to its weird geometry, was paired up with some Goon shoulders and the sidebar photo from 1978 shows how the public could get their hands on this BBC Dalek. The “oddball” skirt ironically then ended up on screen in Destiny of the Daleks, and it was subsequently used as the Supreme in Resurrection of the Daleks, giving it its place in Doctor Who history. The other skirt of similar construction never appeared on screen but was paired up with a set of shoulders which also seemed to have “Goon” origins. This can now be seen on display in Forbidden Planet. Note the same construction of gunboxes without articulation and all the features of the top half which have been mentioned above. 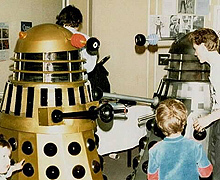 The various “Publicity Daleks” did the rounds at events across the country until one found its way to BBC Manchester. It seemed to be the resident Dalek up north for a time before becoming the prize in a Radio Merseyside give-away, which ultimately resulted in the prop coming into private hands. The Surviving Dalek is painted gold in the early 80s. It was sold a couple of times in the decades that followed and it featured in a number of newspaper stories. It was repainted red before going back to silver, and became available once more for private parties and events in the 21st century, just as it had done decades earlier. It is currently in the care of a collector who is happy to answer questions about the prop. Many thanks to him for his cooperation and endorsement in creating this page. Feel free to drop a private email here.